Listing: House, later public house and shop. Dated 1300 but early C17 with C18 extension, restored 1979-81. Comment: This timber framed house is probably the town's best known building after St Peter's Church. It dates back to the first half of the 17th century. Above the first floor front window there is a carved wooden date board proclaiming "1300". The best explanation of this is that it was some kind of Victorian joke. 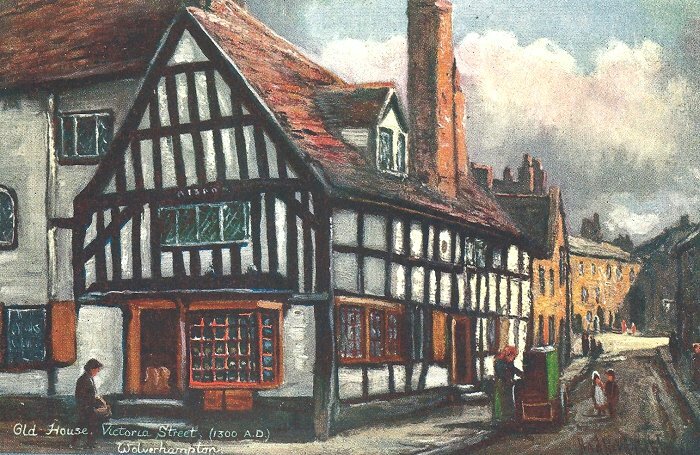 This building survived all the great fires of Wolverhampton and all the demolitions of the 1870s and 1880s which put paid to very many timber framed buildings. 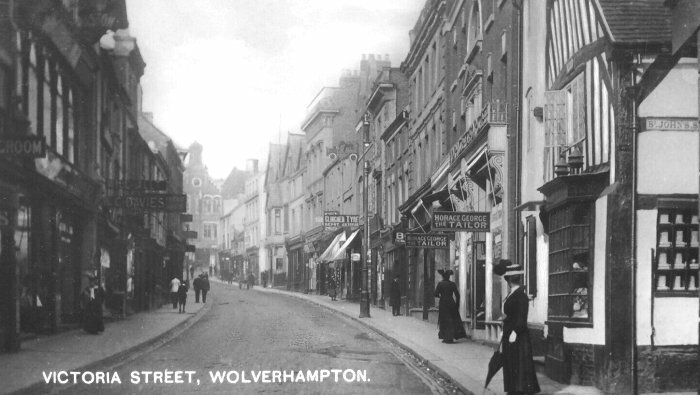 There are now only two left in the centre of Wolverhampton - this one and the one in Exchange Street. 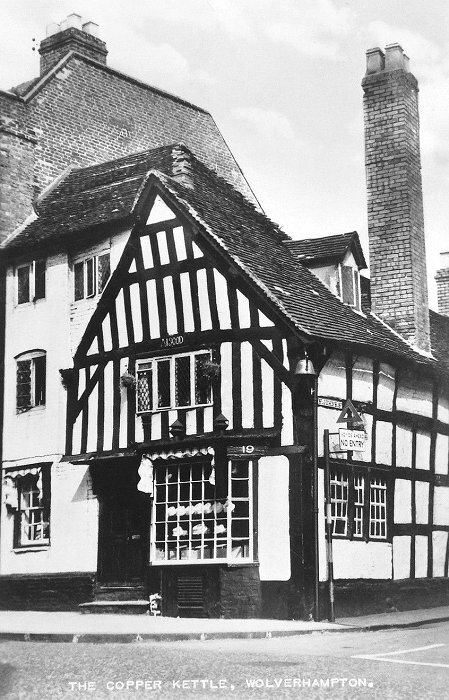 Roper comments that this building "is as good an example of timber framing as could have been seen anywhere in the town" before the Victorian demolitions. This turn of the century postcard shows Victoria Street before it was widened. Lindy Lou is shown as having a bay window. Note also that the window on the side facade no longer exists. In this postcard, probably from the early 60s, the shop is called Lindy Lou and the side facade has an even bigger window. So this building has a particular importance to our architectural history, as well as being an vital element in the street scene. It is also fondly remembered by older people for its more recent uses a baker's shop, a toy shop (whose name, Lindy Lou, is still often used for this building) and a tea shop (whose name, the Copper Kettle, is also often used for this building). This painting from a postcard shows John's Lane - an the tall chimney which had disappeared by the time John Roper wrote. It stands on stone foundation walls and is of the usual post‑and‑truss construction, with brick filling in herringbone and horizontal layers. There appears to be no trace at all of any wattle‑and daub and plaster filling. Internally, there are signs that the low stone walls had openings at intervals, and the house must have stood well up from the level of the ground. Successive alterations to the road and footpath have, of course, obscured much of the exterior stone work. The timbering is of interest. The west gable has bold vertical posts closely spaced in what is sometimes called "post‑and‑pan" arrangement, and is quite different from the square panels of the remainder of the building. There is no evidence that the house was ever of jettied construction, with overhanging gables; the corner posts appear to be part of the original timber framework, and these run from top to bottom of the house without any break. It is just possible that the house once possessed a south gable, but any trace of this from the exterior has long since vanished, and the roof has been rebuilt. A dormer, added in the 17th or early 18th century, remains, but the original tall chimneys have been demolished. The north portion of the house is entirely of brick, and is an addition to the original fabric, made probably about the middle of the 17th century. It is covered by an ingenious hip roof, built directly into the main roof over the gable. The sign above the door says "J. W. Hughes" and there are what seem to be cakes in the front bay window. The photo also shows the tall chimney and some indication of the stone foundations to which Roper referred. It seems that the level of Victoria Street has risen yet again since this photo was taken. Roper points out that the earliest history and occupation of the house are unknown. He refers to the earliest evidence as being in the Hearth Tax returns. These are printed in the Wolverhampton Antiquary, Vol. 1, p.115 ff. Roper identifies this house as that shown in the 1665-6 return as being in the occupation of Thomas Parsehouse; and in the 1673 return as being in the occupation of Thomas Pearshouse, a tanner. (This must be the family which now spells the name as Pursehouse. A present holder of the name, Brad Pursehouse, assures me that there was but one family of this name in Wolverhampton). From the dates Roper deduces that this Thomas "may well have witnessed the building of the northern extension, if he was not, in fact, responsible for it." This undated postcard shows the interior of the Copper Kettle. 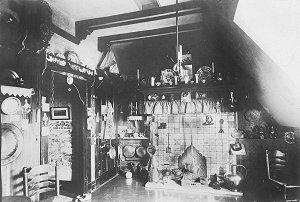 There are some copper kettles in this crowded scene which also shows what seem to be Delft tiles in the fireplace, a Dutch smoulder pot, a Wealden fireback and many other which were, presumably, thought to add character and interest. 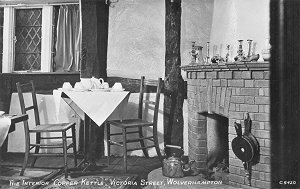 This postcard also shows the interior of the Copper Kettle but with a much more restrained decor. It is all very refined. In the 17th century is also recorded as being the Hand Inn. In more recent times it was a baker's shop, the Copper Kettle tea shop and Lindy Lou's toy shop. In 1979-81 the building was stripped down to its timber frame and completely restored and a bronze plaque on the return facade commemorates this event. For a number of years after that the building was occupied by the Welfare Advice Centre. It was then empty for a few years but in 2000 found a new (and much needed) use as an employment agency specialising in engineering. In about 2004 the ground floor was taken over as a gift shop. It is now a second hand book shop, also selling collectables.